I've been really excited about starting this thread, a place where you can share as little, or as much as you like, about what is going on for you at the moment. I have not always found it easy to find words to express what I feel, so this space is specially dedicated to anyone wishing to start somewhere. You are amongst friends here, let the words open a doorway to your soul. 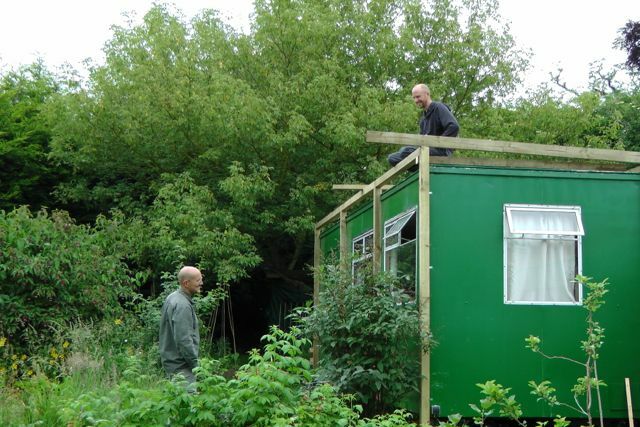 Over the past couple of months I have been renovating the portacabin I live in, situated amongst the birds, bees and trees, in our magical garden here in Glastonbury. Those of you have that attended any workshops here, will know it well. It's taken me on quite a journey to which is almost complete. So many twists and turns and dead ends, much to be contemplated and wondered. I am so grateful for the lessons that have come along, as I have weaved my merry and not so merry way along. One big one that I felt to share with you was my confrontation and understanding of perfectionism. The thing is, I like preciseness, exact amounts, things to be exactly right. What I was finding was quite often, when I was measuring something or cutting a piece of board or something like that, I was finding I was getting tight in my body. "Why is this?" I asked many times, until it became clear enough for me to see. My striving for exactness was strangling the very essence of my soul, the essence yearning to express through all that I am and do. My desire for 3rd dimensional precision was leaving little space for my soul to come through. As I observed and surrendered I managed to let go enough as to allow my soul to lead the way. My mind often laughed at how things would turn out, but the feelings of right action grew ever stronger, I even started making cuts by not even measuring and you know what, they were just right and even if they weren't seemingly perfect, it didn't matter, as a part of me was being born into what I was doing. I was sharing my soul and it was shining back to me, a truly beautiful unfolding. Well, writing that has been fun, a journey in itself!. That was about the fifth revision, I think and I have been writing for well over two hours, but man, well worth it. If any of you would like to share whats going on for you at the moment I would love to hear, I will see if I can post some pictures of my cabin and share the journey with you. As you know, there's always a truth in it - the soul yearning for evolution. The cabin looks awesome - can't wait for the pictures. When I saw your cabin on friday I immediately felt the 'you' behind the cabin. Your energy is shining through from every part of it. Thank you for sharing David. I would like to see the pictures of the cabin too. This is an interesting topic... For me, not because i strive for success but because i am afraid that if i try i can be very good or if i try i may as well fail. i see it in many aspects of my life. i am afraid of disappointment and failure. So i dont put much effort or i am not trying 100% so that if i fail i am not disappointed because i didnt really try... I also think i am afraid of my own potential. another reason is that i havent struggled much in my life. So when something needs more effort i dont put much energy into it. To give you some examples. I play guitar. I usually practice a piece a couple of times and then i can play it. And there was one piece, it wasnt so difficult but for some reason i couldnt play it.. so i would just skip it without practicing harder. Ironically it was my favorite piece.. and i still wouldnt get into it and try to practice and at the same time i was pissed at my self that i couldnt play it. And one day it hitted me.. that i have to put more effort and it doesnt matter if i still dont manage to play it. it sounds funny to say that i wouldnt realise this simple thing. And it took me a long time until i managed to play that piece. Another thing i see is the way i approached studying while i was in Uni. I was staying all night awake to start and finish the assignment. I didnt have time to reread it and correct my mistakes. And i was happy with the grade i would get because i didnt try hard and i didnt have time.. so it was okk if it wasnt the highest mark i could get. And i now know that if i tried more i could get a first class degree. But i didnt. And i was telling to my self that i didnt care about law or the grades. But didnt i? or that i was bored with the subjects but was i? well i was definitely bored with some but not all. I knew that i could get a high mark but still i wasnt trying to get one. There are two reasons i think. One i know i can be very good as a lawyer but i am afraid of diving into it and that i may be good and two, if i try i dont accept that i may fail.. Its like failure is not an option for me but because it may happen i dont commit to something.. Wow i didnt know i was that proud :p I remember one time i went to a math competition. i did horribly in that competition. After that and up until i graduated high school i was happy if i could get 10 out of 20 in the tests. :p It was like everything was blocked. And its strange because i am very proud and i know that in some things i can be good but at the same time i dont believe in my self. Hows that possible? I'm so glad you make your lovely voice be heard in this way! I found this poem some days ago for a dear friend, who's recently set out on a kinda personal Odyssey... I have not shown it to him yet, instead I feel this is now the place to share it (also as a gesture of love for Vaso, since it is by early 20th-c. Greek poet Kavafis). The (our /each of our's) Odyssey is clearly about a man who is roaming about, looking for something and wants to feel perfectly home somewhere. For instance in Ithaca. Or in himself. Thus I felt it belongs here. you’ll have understood by then this is the meaning of Ithaca." Well how blessed am I, three beautiful souls round for dinner, thanks for sharing here guys. Thanks for reminding me of that poem Reka! I completely forgot about it. I remember we kept analyzing the meaning of it back in high school.. Now it has very different meaning for me! big hug to you Vaso mou!!! Oh I love that poem! It touches something very deep inside of me! what happens quite a lot recently because I am living at a place where I do some decoration work and when I work I try to be a 100 % focused and in the moment of what I am doing. And I like doing things properly. So very often when I am in the middle of a job the guy I am living with comes and tells me that I dont have to worry to much about doing it perfectly, or he takes the brush and paints over the parts I just spent 10 min. on to make them look very even because he didn't want me to do a second coat, but the underlying paint was still shining through. So my first reaction is that I get very tight and angry because I feel kind of undermined and I just want to stop in proceeding the work because it feels as if with that interfering the piece of soul I put into the work has been riped out. But then I think, ok it's not my problem if I then need longer to finish a job because I will just paint over it again and realign my piece of soul. Thanks for sharing, Yes i relate to some of what you are saying too. The concept of failure and what it means to me etc is something that i am now discovering. i hadnt contemplated it in depth before.. and its interesting! Anyway, I felt to say that lately, during recent months,it feels like I am finding this balance between aspiring for perfection, which is natural and inherent, but on the other hand, losing all the ego connected to it, losing the tightness and rigidity about it. And, interestingly, what I found this week is the paradoxical perfection of imperfections. Before I would look at things, and myself, and was focused on what is wrong, what is not perfect. Then I started focusing on what is right. Then I could hold both together. And now... surprisingly, they fuse together! Nothing I would expect! There is some kind of mysterious beauty in what is not 'right', what feels like not perfect, but this one allows this whole reality and process to exist. It reminds me of this great movie I enjoyed so much, Cosmopolis. Well, anyway, enjoy your cabin, I see in it an expression of you expressing yourself externally rather than hiding behind the smooth walls :D And I really loved what I saw last time! I'm loving the new website btw - great work! Great to see some more guests dropping round, welcome guys. Looks like we are in for a real treat with that pizza from heaven, yummy! Like your sharing Yulia ;) I know what you mean about perfection in imperfection. I was watching it today and it felt more like a striving, like finding some form of completeness in getting it "just right". I could trace it to a feeling of that I would only be loved, if it is perfect, hence the strong striving. No one loves me :( I guess i'll just have to keep looking till I find it, must be in here somewhere. In the early stages of putting the roof on, consulting with the the foreman. The roof was one of the first bits I built. Just after I finished the heavens opened and I was so delighted to see that it leaked no more, nice! So here they are guys, the long awaited cabin pictures. A gift from the universe! This former portacabin was given to us from a next door neighbor who no longer wanted it. Showing it's age and springing a few to many leaks meant it was time for a bit of diy, bringing a new lease of life to the old girl. First things first, you've gotta get the foundations right. Chris and I shared, pondered, and allowed right action to lead the way. In many ways this sort of project was new to us both, the more we opened, the clearer the way became. Here I have started to fix the cladding on. The wood I used is Western red cedar which I cut down from a woodland just a few miles away. Although I found it hard to cut the trees down, I allowed space to consciously connect with them, a connection that has stayed throughout. So after working on the external my attention was drawn internally also, the walls were in pretty bad shape and on closer inspection the insulation was not up to much. You can't work on the external without looking at your inner world hahaha, so out with the old walls, and in with recycled glass bottle insulation, and new walls. When I took this photo I remember thinking what have I got myself into here. I love the before and afters. Here is the inside now finished. I have used the wood on the inside as well, gives it that wooden cabin rustic feel, and also brings the energy of the magnificent trees inside with me. About love... I feel more like letting it find me than looking for it, but it is how it works with me. 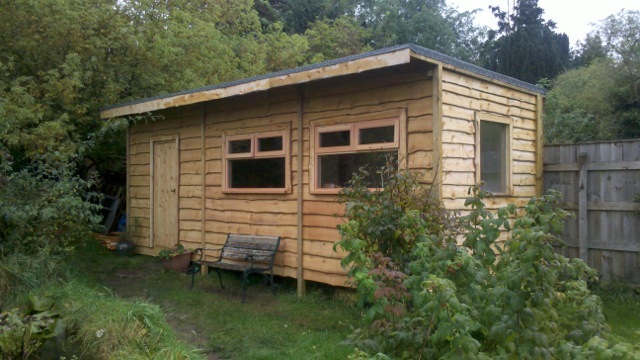 So here are the piccies of my finished cabin. I have now spent a couple of days and nights in here, and I have to say it feels sooo good. OMG I can't breathe!!! This is really amazing!! Beautiful! Well, you know... what if you just don't quite as yet drop that "perrrrrfection thingy" :-)?!?! It's an awesome job Dave - an expression of you. Dave, you're the man! hhhhh Or hmm your cabin IS the man! Ok, I am confused. Dave I love the cabin. It looks great. I'm impressed by your creation, but more so by how you so fully engaged with it, your perseverance, your continued 'self-consciousness' (you know what I mean) throughout the process, and by the natural expression of your beautiful gifts of beingness. You are a multi-talented man and I see the cabin as a work of art. honestly. Thanks for the comments guys, they are really heartwarming. I am so happy to have shared the journey with you. I know what you mean Mark, there is nothing like a bit of digging to get you in the zone. I have just been on a urban preparedness survival weekend. It was awesome! We were looking at all aspects of survival in the event of loss of basic services, food shortages, infra-structure breakdown, within an urban environment. So how to make use of what you have around you, and what the biggest potential threats are, and ways of dealing with them. I love learning about self sufficiency and being resourceful, can't get enough of it. I know there will come a time where it will become part of a new way of living. Hopefully we will get to share it with some of you in the not too distant future. Thank you for sharing this. I find it very deep. There is a temptation to share only the "etheric stuff" on a "spiritual website" - you have demonstrated how everything can be "spiritual", and like others said before I can literally feel your souls love even through the pictures of the cabin. Yeah when your really walking the path, everything your engaged in becomes part of your journey, even hoovering the house! I Love it!, not always though, sometimes can be a pain in the bum. I am right into self sufficiency and surthrival stuff too. Ive done some courses on living off the land, however urban survival sounds like a great tool to have in the kit too. There was a time where all this excess and the behaviour that created it seemed so hopelessly unstoppable that i just wanted to reject it all and go live in the bush. I thought the best way to be part of the solution was through complete non-compliance. But after trying out living on the land, i was humbled to realise that i am not aware enough to live in total harmony with nature and infact, by living there, i was actually causing more stress to what tiny pockets of gaias natural skin that are left in (relative) peace. Now i feel its probably kinder to her to live in town and "redeem" other peoples junk to create systems for living here as gently as possible, rather than stomping around in the bush crushing and scaring who knows what and unknowingly pulling down other creatures homes to build my own etc..
our next projects are a bicycle washing machine and a sun oven. ..so a bicycle washing machine and a sun oven seem the kindest ways of going about this. David, would you mind forwarding me the details of the urban preparedness survival weekend please? i have a couple weeks spare in the UK after the walking the path course on next week and id be interested in going if there happens to be one on. did you ever hear of 'freeganism'? Apparently ridiculous amounts of edible food and useable resources are literally thrown away or destroyed every day. There's lots of info online. figures such as "15 million tonnes of food" in the UK every year! 'freegans', as I understand it, feed themselves largely from some of what would otherwise be discarded (or already has been) as well as living in ways that use less or minimal extra resources. It makes some sense. I remember sitting in a cafe with a friend of mine a few years back and he managed to get a decent sized meal just by helping himself to food that other people had left behind, and there was more to spare. It may sound a bit funny but its a powerful mirror I think. That food was otherwise 'destined' for the bin! Its an interesting way of living in the matrix but not 'buying into it'. I think there's lots of ways to be more in tune with the earth and living in more 'aligned' ways in the city. even living with other people is one step as it saves money towards fuel and so forth. A bicycle washing machine, sounds interesting. Do you really need a machine?, what about a good old sponge and bucket of water? The survival course I went on was the last one of this year. There are many aspects of it that would come naturally, if you explore what impact having no electricity, gas, running water, and such like, would have on you and those around. Anything you could do to prepare would be a real bonus, like maybe stocking up on some tin and dried food, bottles of water, candles etc. The bonus of being in an urban environment is the abundance of stuff and materials you can improvise with, creativity and resourcefulness will really come into their own here. oh cool, i didnt know there was a term for this, "freegan" sounds a bit nicer than "dung beetle" i guess. Im sure freegan websites will be another good source of ideas and inspiration - thanks for the heads up. Ive contemplated dumpster diving before, however watching friends come back with their harvest ive noticed the food is usually packaged and processed stuff, and its a similar issue with other peoples left-overs for me, id prefer to eat whats growing in my garden over this food. We grow a good portion of our own food, the only thing we really buy are grains, oil and herbs from our local food co-op. However, When I travel i cant eat from my garden, so i guess i will feel out whats my highest choice then - eating recycled, less nourishing food or purchasing more nourishing food. ohhh, I seeee, a bicycle powered washing machine, now I get it. I thought you meant a machine to wash bicycles (seemed a little pointless). Thats a great idea, I had not heard of one before. I would love to see that in action. You must have found somewhere else that runs a similar course, the company I did it with haven't got one on till next year, I guess there must be a few out there. i will consider devising a washing machine for my bicycle after i get around to installing my "everythings ok" alarm lol. I did dumster diving until I left for Canada in June and could cover about 80 percent of my food need with that! It was unbelievable what shops would throw away. It broke my heart to see that, and so it felt as if the lower energy of the non organic food was balanced out with the act of saving it from being wasted. What I experienced was that there wasnt only the processed stuff but mostly vegetable and fruits in the dumpsters. I also went to dumpsters of organic food stores and didnt think that I would find a lot there, but wrong!!! That shows that organic supermarkets are enslaved by their customers like the big stores, or rather that people who buy their food at organic shops have the same expectations of 'perfection' and therefore the shops attune to that expectation. With buying organic food there comes no change in consciousness unfortunately. What I also found over time as my spiritual consciousness grew was that I became more and more sensitive to food and in the end I couldn't really cope with the non organic 'dumpster food'. So that put me ín a difficult position as I still feel that it is so wrong to throw good food away but on the other hand I feel the need to get purer and purer from both the inside and outside. I have to contemplate that topic again! Very intrigued, I had a quick look on youtube and saw this. How awesome is that! I wanna have a go at building one, don't know where we would put it though. yes they are quite bulky. another less bulky idea is the plunger washing machine but as far as i can see theres no way to spin dry with this. I remember the days, before the time of all this super fast technology. I'll give you a clue, well kind of cryptic clue anyway. Whenever I think about this job, Mary poppins comes to mind. - built a portal between dimensions. - found a treasure map in lots of pieces. - completed his latest clothing line for the 'Man about Nature'. 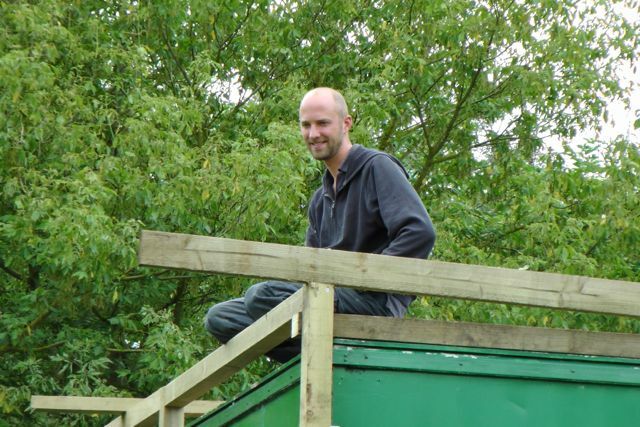 but of course he is building a chimney for his wood burner. Aha. So David has moved away from the victorian values of sending small children up the the chimney to developing a radio controlled vehicle with a toilet brush attached? Imagine trying to survive in this world without money in our pockets. It wouldn't be easy, but it feels as though thats how it should be. Exchanging trading, i'll fix your lawnmower for a loaf of your lovingly home cooked bread. Ahhh, can you imagine? how awesome that would be. I am really inspired by this guy, Mark Boyle, who has lived without money from 2008. What a dude! Thats proper two fingers up to the financial system. He has just released a new book called the "Moneyless Manifesto" which is where I came across this short little video. The type I felt to experiment with requires just a few bricks carefully stacked together to make what looks like a mini chimney. You then light a fire in the bottom, and the natural drawing effect means you get a really efficient, clean burning fire that you can cook on. So in keeping consumption to as minimum as possible, I headed of to our local reclamation yard, an Aladdin's cave of used and recycled materials. No shortage of bricks here, and as I found the ones I felt would be most suitable, even the contemplation of buying second hand ones, didn't feel right either. I mean you see used bricks around all the time, surely if I kept my eyes open I would find some that needed a good home. So I parked the idea for a while and left an open space for what was meant to be. Well the universe orchestrated a masterpiece with this one. As I headed off for a walk that afternoon, I happened to catch an eye of some builders emptying a mini dumper into a skip. As I got closer I could see there were bricks in there, not only bricks but brand new ones!. I asked them why they were throwing them away and they told me it was cheaper to throw them away than send them back! I would like to say I was surprised, but I wasn't. In the matrix the cost to the planet is rarely taken into consideration and here was a classic example right in front of me. They were more than happy for me to have them though. Not only was there enough for me to build a rocket stove but I also got enough for making the foundations for our soon to come greenhouse, I must have collected around 6 wheelbarrow loads. In one sense it is, and was, heartbreaking to see the waste and disregard for our planet like this. But in being able to be as resourceful and use as little as possible within it such a world, I feel like I am giving something back and it brings me so much joy and appreciation for what I do have. It is truly amazing what you can find that people have thrown away. Not only were there bricks in there, but also a couple of perfectly good extension leads and a pallet. I am more than ever inspired to see how ever more resourceful I can be. Lets see what we can make. Here is a short video on how to build a rocket stove. You can use any type of bricks, but from what I am discovering, the more they offer in insulation the better. And if any of you have any tips or tricks on being more resourceful I would love to hear them. I can see why :). When I was routing around in the tip I was so happy. Reclaiming something that was not far off being dumped in a land fill site. Each and every one was like uncovering a piece of hidden treasure. I was at a fellow openhanders this afternoon, and as I was waiting in her kitchen I noticed a broken plastic tap on her work bench. This would be perfect for the composting bin that I am making at the moment, I wonder if she still wants it. When I asked she said "I had been waiting for someone to come along for that" How amazing is that! something so small, but it felt like it had the magic of the whole universe behind it, wow, and shouldn't be too hard to fix either. Little by little, piece by piece, it has been re-born into it's new, very welcome home. It has been cold, but so satisfying, especially the fact that it is second hand. Mmmmm home grown veggies just around the corner, thats if we can beat the slugs to them!